Who are Dillon & Semenovich? A name is not just a name when it has meaning. 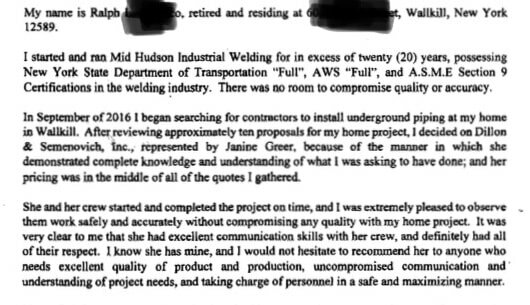 This is exactly what the company's owner, Janine Greer, thought when selecting the right name for her site work construction company. To read more about Dillon & Semenovich, and the company name, click to read our blog on "What's In a Name?" "Janine has a remarkable way of listening to your goals and then creating something better than you can communicate. I had a few challenges and she was able to solve all of them. She was able to look at the site and figure out problems with drainage and light. She created stone walkways and easy to care for gardens around my home and it completely transformed everything. Everyone who visits remarks on them! SHE IS THE BEST!"